This post will help you understand the difference between added sugar, artificial sugar, and natural sugar. 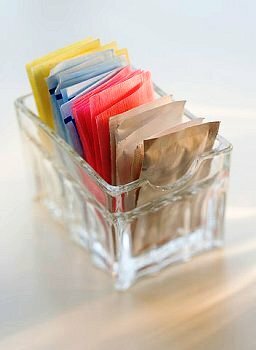 Natural Sugar is a food derived sweetener, such as: Sucrose, Confectioner’s Sugar, Brown Sugar, Raw Sugar aka Turbinado Sugar, Succanat, Molasses, Maple Syrup, Maple Sugar, Honey, Raw Honey, Agave Syrup, Brown Rice Syrup, Malted Barley Syrup, Date Sugar, Corn Syrup, Corn Syrup Solids, Dextrose, Lactose, Maltose Syrup, Fructose, Xylitol, Sorbitol, Stevia, Cane Juice, Dehydrated Cane Juice, Evaporated Cane Juice, Fruit Juice Concentrate, Coconut Sugar, Coconut Syrup, Palm Sugar, Sorghum Syrup, Beet Sugar. Artificial Sugar is a chemically derived sweetener, such as: Equal, Sweet ‘N Low, Splenda, Nutra Sweet, Sugar Twin, Sunett, Sweet One, and Saccharin. Copyright 2013 Irene Pastore, and Blue Moon Personal Training. Posted on February 22, 2013, in Food and tagged Added sugar, artificial sweeteners, Natural sugar. Bookmark the permalink. Leave a comment.